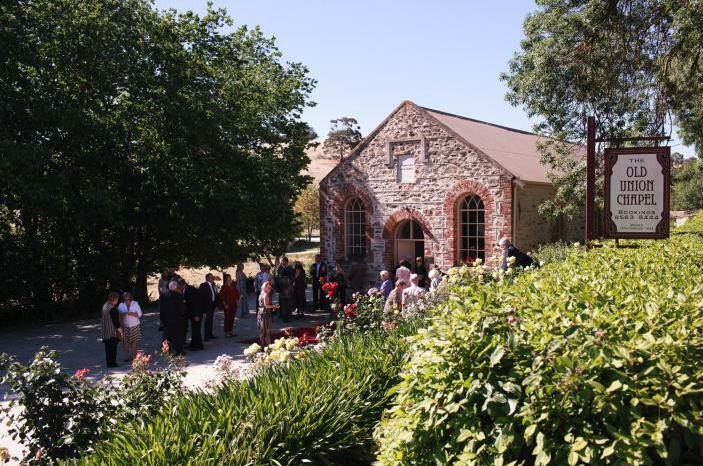 Set in the leafy Barossa Valley township of Angaston and layered with history, the Old Union Chapel is the perfect venue for everything from weddings, naming ceremonies and baptisms to corporate functions, exhibitions and concerts. With its beautiful stone facade, timber floors, attractive garden, shaded areas for outdoor entertaining and convenient location close to a number of reception venues, the Old Union Chapel is a true local treasure. As the Barossa’s oldest public building, the Chapel’s history forms part of a rich tapestry of local church activities from the time of settlement. Built in 1844 to provide a place of worship for people of all denominations, this church became a meeting place for many years before falling into a state of disrepair and being uitlised as a farm building. Restored in 1989-1994 as a Bi-centennial project to commemorate the local pioneering spirit and religious freedom, the Chapel’s rejuvenation saw it added to the Register of State Heritage in 1993. Since then this unique public building has become a much-loved destination for locals and visitors looking to celebrate milestones in an historic setting.